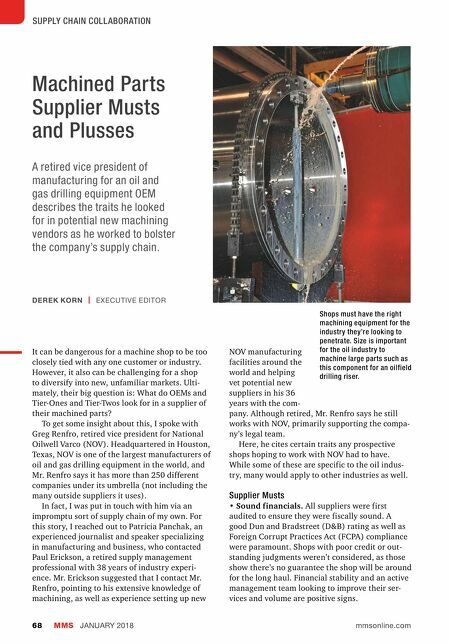 OEM Advice Modern Machine Shop 69 • The right equipment. The types of machined parts needed for deep-sea and land- based oil and gas drilling equipment could largely be divided into two types: relatively small and very big. 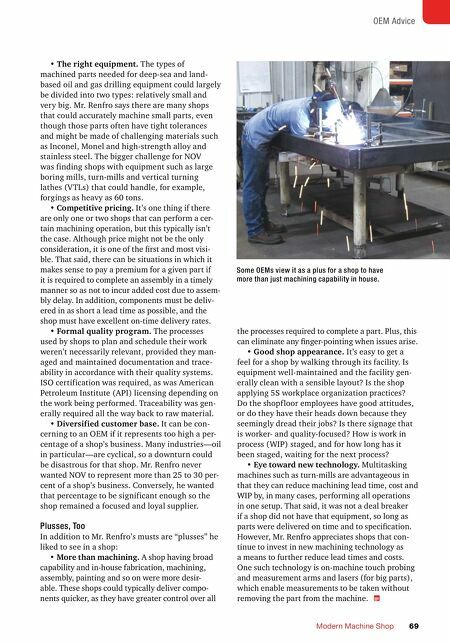 Mr. Renfro says there are many shops that could accurately machine small parts, even though those parts often have tight tolerances and might be made of challenging materials such as Inconel, Monel and high-strength alloy and stainless steel. The bigger challenge for NOV was finding shops with equipment such as large boring mills, turn-mills and vertical turning lathes (VTLs) that could handle, for example, forgings as heavy as 60 tons. • Competitive pricing. It's one thing if there are only one or two shops that can perform a cer- tain machining operation, but this typically isn't the case. Although price might not be the only consideration, it is one of the first and most visi- ble. That said, there can be situations in which it makes sense to pay a premium for a given part if it is required to complete an assembly in a timely manner so as not to incur added cost due to assem- bly delay. In addition, components must be deliv- ered in as short a lead time as possible, and the shop must have excellent on-time delivery rates. • Formal quality program. The processes used by shops to plan and schedule their work weren't necessarily relevant, provided they man- aged and maintained documentation and trace- ability in accordance with their quality systems. ISO certification was required, as was American Petroleum Institute (API) licensing depending on the work being performed. Traceability was gen- erally required all the way back to raw material. • Diversified customer base. It can be con- cerning to an OEM if it represents too high a per- centage of a shop's business. Many industries—oil in particular—are cyclical, so a downturn could be disastrous for that shop. Mr. Renfro never wanted NOV to represent more than 25 to 30 per- cent of a shop's business. Conversely, he wanted that percentage to be significant enough so the shop remained a focused and loyal supplier. Plusses, Too In addition to Mr. Renfro's musts are "plusses" he liked to see in a shop: • More than machining. A shop having broad capability and in-house fabrication, machining, assembly, painting and so on were more desir- able. These shops could typically deliver compo- nents quicker, as they have greater control over all the processes required to complete a part. Plus, this can eliminate any finger-pointing when issues arise. • Good shop appearance. It's easy to get a feel for a shop by walking through its facility. Is equipment well-maintained and the facility gen- erally clean with a sensible layout? Is the shop applying 5S workplace organization practices? Do the shopf loor employees have good attitudes, or do they have their heads down because they seemingly dread their jobs? Is there signage that is worker- and quality-focused? How is work in process (WIP) staged, and for how long has it been staged, waiting for the next process? • Eye toward new technology. Multitasking machines such as turn-mills are advantageous in that they can reduce machining lead time, cost and WIP by, in many cases, performing all operations in one setup. That said, it was not a deal breaker if a shop did not have that equipment, so long as parts were delivered on time and to specification. However, Mr. Renfro appreciates shops that con- tinue to invest in new machining technology as a means to further reduce lead times and costs. One such technology is on-machine touch probing and measurement arms and lasers (for big parts), which enable measurements to be taken without removing the part from the machine. Some OEMs view it as a plus for a shop to have more than just machining capability in house.